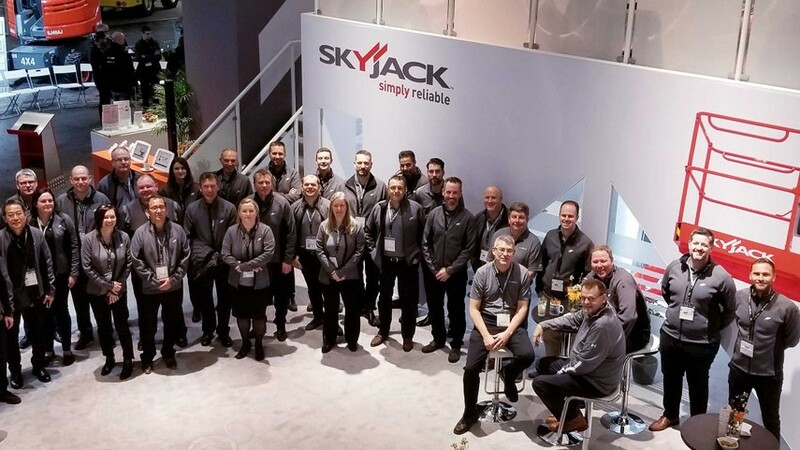 "Our team updated our full-size rough terrain scissor lifts in conjunction with Stage V Emission Standards and produced our largest scissor lift to date," said Brad Boehler, president at Skyjack. "We also have our next generation of DC scissor lifts here at the show, so we wanted attendees to be able to be inside and comfortable as they walk around our new products." The SJ4740 DC electric scissor lift was the first of the next generation Skyjack had on stand. The changes made to the next generation machines help create a more globally aligned range and the industry-leader stated that by the end of 2019, all DC electric scissor lifts will boast the improvements shown. Those include a new control box, single location emergency lowering switch, adjusted pothole protection, new SKYCODED diagnostic display, and a more rigid scissor stack. "Skyjack's full-size rough terrain scissor lifts have kept up with standards over the years, but haven't had many major adjustments since they were introduced," Skyjack product manager Corey Connolly explained. "The European Stage V Emission Standards gave us the opportunity to take a step back and see how we can increase utilization and demand for our customers." Boasting increased height, capacity, and faster function speeds across the board, Skyjack's new full-size rough terrain scissor lift, the SJ9253 RT, was well received by this new audience. "Another item we're excited to have with us on stand is our self-check demo machine," said Boehler. "It generated a lot of interest at The ARA Show in California, and that shows our team that we're headed in the right direction when it comes to autonomy."